The system of membrane receptor Fas and its ligand FasL compose one of the main pathways triggering apoptosis. However, the role of their soluble forms has not been clarified yet. Although sFasL can be converted from the membrane-bound form by matrix metalloproteinases (MMPs), there are no data on relations between sFas/sFasL, MMPs and their tissue inhibitors (TIMPs) in patients on chronic dialysis—neither children nor adults. The aim of our study was to evaluate serum concentrations of sFas, sFasL, and their potential regulators (MMP-2, MMP-7, MMP-9, TIMP-1, TIMP-2), in children and young adults chronically dialyzed. Twenty-two children on automated peritoneal dialysis (APD), 19 patients on hemodialysis (HD) and 30 controls were examined. Serum concentrations of sFas, sFasL, MMPs and TIMPs were assessed by ELISA. Median values of sFas, sFasL, sFas/sFasL ratio, MMP-2, MMP-7, MMP-9, TIMP-1 and TIMP-2 were significantly elevated in all dialyzed patients vs. controls, the highest values being observed in subjects on HD. A single HD session caused the decrease in values of all parameters to the levels below those seen in children on APD. Regression analysis revealed that MMP-7 and TIMP-1 were the best predictors of sFas and sFasL concentrations. Children and young adults on chronic dialysis are prone to sFas/sFasL system dysfunction, more pronounced in patients on hemodialysis. The correlations between sFas/sFasL and examined enzymes suggest that MMPs and TIMPs take part in the regulation of cell death in the pediatric population on chronic dialysis, triggering both anti- (sFas) and pro-apoptotic (sFasL) mechanisms. Patients with chronic kidney disease (CKD) are prone to enhanced apoptosis, additionally accelerated by the dialysis procedure and the type of membrane that has been used [1, 2]. The system of membrane receptor Fas and its ligand FasL compose one of the main pathways leading to programmed cell death. Fas, expressed on a wide variety of cells, binds to its ligand, restricted mainly to macrophages, T lymphocytes and endothelial cells, thus triggering the apoptotic pathway . Recent investigation has correlated these events with vascular damage and subsequent progression of atherosclerosis, being another hallmark of CKD . Indeed, vascular smooth muscle cells (VSMCs) are resistant to apoptosis in atherosclerotic lesions  and sensitive to it in normal vessels . Therefore, it has been suggested that FasL-induced apoptosis in normal vessel wall acts in a protective way by decreasing neointimal hyperplasia and thickening , whereas in atherosclerosis this mechanism seems ineffective, paradoxically increasing cell migration and inflammation . 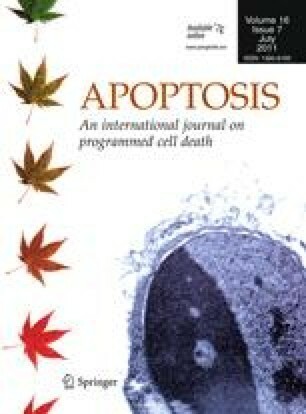 The soluble forms of death receptor and its ligand, sFas and sFasL, have recently been discovered, but their role in control of apoptosis has not been clarified yet. sFasL is proteolytically shed from its membrane-bound form by enzymes—matrix metalloproteinases (MMPs) . The strongest evidence for such activity has been shown in in vitro experiments concerning matrilysin (MMP-7) . The applicability of this regulatory pathway in clinical practice has focused on overcoming drug resistance to chemotherapy [10, 11] or controlling mesangial inflammation , but it has not been considered in the light of chronic kidney disease so far. The pro-apoptotic activity of sFasL is decreased in comparison to that of the membrane FasL . Therefore, there is controversy whether such conversion from the membrane-bound to the circulating form may be regarded as an anti-apoptotic mechanism, controlled by matrix metalloproteinases, or is it still the pro-apoptotic feature in the sFasL characteristics that prevails . Despite evidence for pro-apoptotic and anti-inflammatory activity of FasL, taking part in protection against neointimal hyperplasia after vascular injury , the parallel profile has not been proven in the case of sFasL. sFas acts in an anti-apoptotic way by blocking both FasL and sFasL in a 1:1 proportion. It has also been defined as a marker of inflammation and endothelial dysfunction in adults with coronary artery disease and chronic kidney disease [15, 16]. Experimental data have shown the role of sFas in protecting the vessel wall integrity against injury . However, the role of matrix metalloproteinases in sFas shedding is unknown and there are no data on relations between sFas/sFasL, MMPs, their tissue inhibitors (TIMPs) and inflammation/endothelial function in patients with end stage renal disease. The investigation comparing those parameters in the subjects treated with different dialysis modalities is lacking either. Therefore, our aim was to assess the serum levels of sFas, sFasL and the values of sFas/sFasL ratio as a marker of overall apoptotic activity, in children and young adults on peritoneal dialysis and hemodialysis, searching for the differences between those modalities. We also investigated the correlations between sFas, sFasL, their potential regulators—matrix metalloproteinases (MMP-2, MMP-7 and MMP-9) and their tissue inhibitors (TIMP-1 and TIMP-2), as well as clinical significance of these findings, in the pediatric population on dialysis. Seventy-one patients enrolled in the study were divided into three groups. Data are shown in Table 1. The first group consisted of 22 children on automated peritoneal dialysis (APD—Baxter, Home choice), 5 of them having residual renal function. The patients had 5–8 exchanges during the night and, if necessary, one or two during the day. Peritoneal fluids used in our patients had glucose concentrations varying from 1.36 to 2.27%. The causative factors in CKD were: chronic pyelonephritis (seven cases), chronic glomerulonephritis (six), polycystic kidney disease (two), neurogenic bladder (three), hemolytic uremic syndrome (two) and unknown (two). The second group included nineteen children and young adults hemodialyzed (HD) on polysulfone (PS) membranes, only three out of them with residual kidney function. HD sessions (3.5–4 h) were performed three times a week, using bicarbonate dialysate, the blood flow ranged from 150 to 200 ml/min, dialysate flow did not exceed 500 ml/min. The membrane area was between 1.0 and 1.6 m2, the dialyzers were not reused. The water, purified by reosmosis, was regularly checked for contamination. All patients were on stable anticoagulation regimen using low-molecular-weight heparin. The causative factors in chronic renal failure were: chronic glomerulonephritis (seven cases), chronic pyelonephritis (seven), neurogenic bladder (two), polycystic kidney disease (one) and unknown (two). Thirty age-matched children with primary nocturnal enuresis and normal kidney function, served as controls. None of the patients showed clinical evidence of infection, had diabetes, malignancies or vasculitides, smoked, took antibiotics, statins, corticosteroids or immunosuppressive therapy. All APD children had their blood pressure values below the 90th percentile, adjusted for gender and age, according to the criteria of the fourth report on high blood pressure in children and adolescents , and did not require anti-hypertensives. The blood pressure in our HD patients was within normal values without medication (12 patients) or was well controlled with the use of ACE inhibitors only (3) or ACE inhibitors with calcium channel blockers (4). Informed consent was obtained from the subjects and their parents, if necessary. The research project has been approved by the University ethics committee, in accordance with the Helsinki declaration. Blood samples were drawn after an overnight fast from peripheral veins in APD patients and controls, in HD subjects—from the afferent line of the first-use dialyzer before starting an HD session. Samples were clotted for 30 min, centrifuged at 4°C for 10 min, and then serum was stored at −20°C until assayed. Serum concentrations of sFas, sFasL, MMP-2 (gelatinase A), MMP-7 (matrilysin), MMP-9 (gelatinase B), TIMP-1 and TIMP-2 were evaluated by commercially available ELISA kits (R&D Systems, Abingdon, UK). Standards and serum samples were transferred to 96 well microplates pre-coated with recombinant antibodies to human sFas, sFasL, MMP-2, MMP-7, MMP-9, TIMP-1 and TIMP-2. Each sample was tested in duplicate and the arithmetical mean was considered a final result. Measurements were performed according to the manufacturer’s instructions, results were calculated by reference to standard curves. In all patients high sensitivity CRP, as a marker of inflammation (nephelometry by Dade Behring, Marburg, Germany), was also evaluated. Results are expressed as median values and interquartile ranges. Differences between all groups and between the values before and after a single dialysis session were evaluated by using nonparametric tests (Kruskall–Wallis, Mann–Whitney U, Wilcoxon). The relations between parameters were assessed by Spearman’s correlation coefficient and by linear regression analysis. The linear regression equations were calculated as y = βx + a (y is the dependent variable, β is the regression coefficient, x is the independent variable, a is the constant term). We presented only those equations where both regression coefficient and constant term were statistically significant. Statistical analysis was performed using the package Statistica ver. 9.0. A p value <0.05 was considered significant. sFas and sFasL median values were significantly higher in all dialyzed patients when compared to controls (p < 0.01) and the levels in the HD subgroup were higher than in the APD subjects (Figs. 1, 2). A single hemodialysis session decreased the concentrations of both parameters to the values below those seen in children on APD, yet they remained increased vs. controls. The values of the ratio were elevated in children on dialysis in comparison to the control group, being the highest in the hemodialyzed subjects (Fig. 3). The HD session diminished them, but without significant difference between post-hemodialysis and APD patients. The median values of MMP-2, MMP-7, MMP-9, TIMP-1 and TIMP-2 were increased in the population on dialysis when compared to the controls and the highest values were observed in patients on hemodialysis (Table 1). A single HD session diminished their concentrations to the levels lower than those observed in children on peritoneal dialysis (Table 1). High sensitivity CRP levels did not show significant differences between dialyzed children and controls (Table 1), and a single HD session had no impact on its concentration. In all dialyzed patients, sFas, sFasL, MMPs and TIMPs correlated with each other (Table 2). Although all MMPs and TIMPs predicted the values of sFas and sFasL (Table 3), MMP-7 and TIMP-1 were the most accurate ones. No associations between sFas/sFasL and hsCRP were observed. Our study describes for the first time the disturbed sFas/sFasL system, and the potential role of MMPs and TIMPs in its regulation, in children with end stage renal failure on dialysis. sFas concentrations were increased in all patients on dialysis, which is concordant with previous observations in adults [17, 19, 20]. Such elevation may be a consequence of molecule accumulation due to decreasing GFR . Perianayagam et al. have noticed that sFas levels in dialysed patients were higher than in pre-dialysis subjects, which may point at the dialysis per se as a procedure aggravating sFas release . The accelerated synthesis of sFas, as a protective anti-apoptotic mechanism, cannot be neglected either . sFas levels increase also with age . Indeed, when we compared the concentrations of sFas in corresponding groups of children and adults , the latter were much higher. Additionally, sFas is a marker of atherosclerosis, endothelial dysfunction and coronary artery calcification—features characteristic for uremia [16, 23, 24]. However, the results concerning differences in sFas concentrations between various dialysis modalities are inconsistent. The probable source of discrepancies might be the difference between examined populations, concerning number of subjects and their age. However, the impact of methodology cannot be neglected either. Perianayagam et al. reported on sFas levels being higher in patients on PD than in those on high-flux hemodialysis, whereas Dalboni et al. found no difference between adults on continuous ambulatory peritoneal dialysis (CAPD) and subjects dialyzed on reused polysulfone membranes. None of the above mentioned conditions were similar to ours, because we examined children, performing APD and low-flux HD on first-use dialysers. This is also the first report on the influence of a single hemodialysis session on sFas concentrations. The post-dialysis drop in sFas levels may be of various origins. As a middle molecule (~50 kd), it can be only partly cleared during hemodialysis procedure. However, the adsorption on the membrane surface, as well as formation of sFas-sFasL complexes, also have to be taken into account. Although a single HD session was able to correct the sFas discrepancies to the levels below those seen in APD, this effect seems transient. It is probable, however, that the enlargement of total hemodialysis dose, e.g. by increasing its frequency, would ameliorate the patients’ status by diminishing the overall apoptotic activity and avoiding sinusoidal changes in sFas concentrations between subsequent sessions. The high sFas levels in patients on chronic dialysis may also picture an attempt to protect vulnerable tissues against apoptosis, and in a long term perspective—diminish the risk of vascular calcification . However, although promising, this theory needs to be verified in the future investigation. Studies evaluating sFasL in the population on chronic dialysis are even less numerous that those concerning sFas. Perianayagam et al. observed no difference between the concentrations of sFasL in healthy controls, pre-dialysis subjects and those on dialysis, irrespective of the method used. Kirmizis et al. found no improvement in apoptosis markers after a 6-month course of hemodialysis on vitamin E-coated membranes vs. other membranes used earlier, but they did not compare those values with the control group of healthy subjects. In our population, sFasL behaved similarly to sFas—there was a significant increase in all dialyzed children, with preponderance in those on hemodialysis. The sFasL elevation might result from the combination of mFasL overexpression on inflammatory cells, characteristic for increased apoptosis, and overactivity of MMPs and TIMPs, additionally triggering the sFasL shedding . The accumulation due to renal failure is also possible, although the inverse correlation, existing between GFR and sFas, has not been confirmed in the case of sFasL. A single HD session diminished the sFasL concentrations to the values lower than those in APD patients. That decrease, even more evident than in the case of sFas, may be attributed to the fact that sFasL is a molecule smaller that sFas (~30 vs. 50 kd) and its clearance is more effective. The adsorption on the membrane surface and formation of sFas-sFasL complexes, should also be taken into account as alternative explanations. Last, but not least, the long-term effect of the transient intradialytic leukopenia cannot be neglected either. However, the unresolved problem is whether sFasL, due to its decreased apoptotic potential vs. mFasL, should be regarded as an anti- or pro-apoptotic factor. Indeed, when the increased overall activity of mFasL on immunocompetent cells in uremia is considered, the weaker pro-apoptotic impact of sFasL vs. mFasL cannot compensate the overexpression of the latter and, therefore, cannot be interpreted solely as an anti-apoptotic action. Likewise, the fact that sFas and sFasL antagonize each other by stoichiometric binding 1:1, speaks in favor of their ambiguous activities. Moreover, recent investigation in knockout mice has suggested that high levels of sFasL may trigger autoimmune reactions and promote tumorigenesis . Therefore, the best way to assess the overall apoptotic activity would rather be to evaluate the proportion between the concentrations of sFas and sFasL. The values of sFas/sFasL ratio followed the same pattern as both parameters analyzed separately, with one exception. The difference between post-hemodialysis and APD subjects has vanished, suggesting that the overall apoptotic ability of patients on peritoneal dialysis is comparable to that in patients after a HD session. Consequently, subjects on hemodialysis are prone to fluctuations, whereas children on peritoneal dialysis seem fairly stable, which is of paramount importance, as this modality is a method of choice in pediatric population with end stage renal disease. The subject of sFas/sFasL relation to MMPs and TIMPs has never been described in patients with chronic kidney disease. We have previously reported on increased concentrations of MMP-7 and TIMP-1 in children on chronic dialysis, with their values being higher in hemodialyzed patients than in those on peritoneal dialysis . Our currently extended panel has also covered gelatinases (MMP-2, MMP-9) and TIMP-2, showing the similar pattern of discrepancy between children on APD and HD. Like in the case of sFasL, all parameters decreased after a HD session to the levels below those seen in APD children, probably due to both adsorption on the dialysis membrane and formation of MMP-TIMP complexes. This concordance could also result from the potential regulatory role of MMPs and TIMPs in shedding sFasL from its membrane-bound form mFasL. Moreover, all MMPs and TIMPs could predict sFasL concentrations in the dialyzed population. Among these, MMP-7 and TIMP-1 turned out to be the best predictors of sFaL. While MMP-7 occupies an established position of an enzyme critical in sFasL formation [10, 11, 12], the influence of TIMP-1 on the process is a new finding. Nevertheless, the fact that TIMP-1 is a MMP-9 specific inhibitor, and the suppression of the latter promotes apoptosis, could render a probable explanation for the observed correlation . The discrepancies in accuracy of prediction between various MMPs and TIMPs may result from alternative cleavage sites, thus creating forms with different activity and individual apoptotic potential . Another intriguing question is whether MMPs and TIMPs can also take part in the regulation of sFas shedding, thus influencing apoptosis, inflammation and endothelial function. So far, the only known way of sFas synthesis is that by the alternatively spliced mRNA, so the role of MMPs and TIMPs in mFasL cleavage seems questionable . However, sFasL correlations with proteases may merely suggest that those enzymes could be considered markers of inflammation and endothelial dysfunction. Therefore, the real nature of relations between sFas, MMPs and TIMPs requires further investigation. Children and young adults on chronic dialysis present with sFas/sFasL system dysfunction and increased apoptotic activity, less pronounced in patients on peritoneal dialysis. The correlations between sFas/sFasL, MMPs and TIMPs suggest that those enzymes may influence the programmed cell death by stimulating both protective (sFas) and destructive (sFasL) mechanisms responsible for apoptosis in that group of patients.